Centrate line before (top) and after (above) HydroFLOW installation. 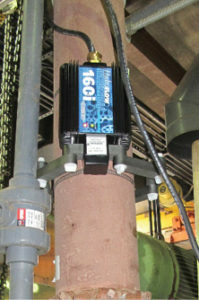 Right: HydroFLOW 160i device installed on digested sludge feed line to a belt filter press. HydroFLOW is a water conditioning device that induces an electric signal of +/-150 kilohertz into the liquid inside any pipe on which it is installed. A specialized transducer connected to a ring of ferrites performs the electric induction. The technology was developed in England over 20 years ago, for calcium carbonate scale removal and scale prevention in domestic water heating applications. Various device configurations have been used in the power generation, commercial, industrial, hospitality, food service, municipal, mining, oil and gas, maritime, agriculture and aquaculture sectors. Hydropath Technologies has expanded the use of HydroFLOW technology in the wastewater sector, specifically, reducing polymer use and controlling struvite and other scale forming issues during sludge dewatering processes. As a result of positive trials in the U.S., HydroFLOW USA conducted a mini-seminar at WEFTEC 2015 in Chicago, with the goal of sharing this technology and finding partners to collaborate with. One outcome of this seminar was the arrangement with GEA Westfalia Separator to conduct a trial at a centrifuge installation in Somersworth, New Hampshire. In November 2015, two HydroFLOW 160i units were installed on the sludge pipe feeding the GEA Westfalia Separator model CB 505-00-32 centrifuge. One unit was placed before the centrifuge, just after the thickened waste activated sludge pump, and the other was placed before the feed tube just before the centrifuge. Both units were installed without process down-time as they are fitted around existing piping and do not require plumbing modifications. The units use 120V AC and draw less than 1 Amp, which is similar to the power consumed by a 60-watt light bulb. Success for this facility meant reducing polymer usage and producing dryer cake, while not adversely impacting the centrate quality. The centrate quality in Somersworth typically averages about 500 mg TSS/L, but rarely exceeds 1,000 mg TSS/L. Surpassing the 1,000 mg TSS/L threshold could affect the plant treatment capacity. The trial protocol dictated an incremental reduction of polymer dosing while monitoring the cake solids. If the cake became too wet (below 20% total solids), polymer reduction would cease. During six testing sequences, utilization of the HydroFLOW devices allowed for the reduction in polymer use from an average of 25.5 to 19.1 pounds per dry ton (25.1% reduction) and increased cake solids by up to 3% total solids, as compared to the same process without the devices operating. Additionally, the centrate quality was maintained within testing limits of less than 1,000 mg TSS/L. Based upon current polymer costs and use, the estimated payback for Somersworth for this device is approximately 1.5 to 2 years. 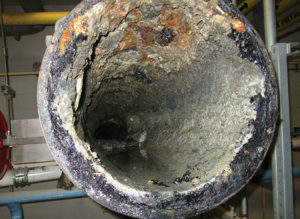 Actual reduction of polymer and cake dryness in the dewatering watering process has many variables. More recently, HydroFLOW has been focusing on struvite control in sludge and anaerobic treatment processes at water reclamation facilities. In February 2016, a HydroFLOW 160i device was placed on the digested sludge feed line to the belt press dewatering devices with the intent of reducing polymer use and affecting the struvite scale that was problematic on their four two-metre belt presses. There was some moderate polymer reduction. Struvite was reduced in its scaling effect and softened within eight days to become easily scraped off the rollers and drums. 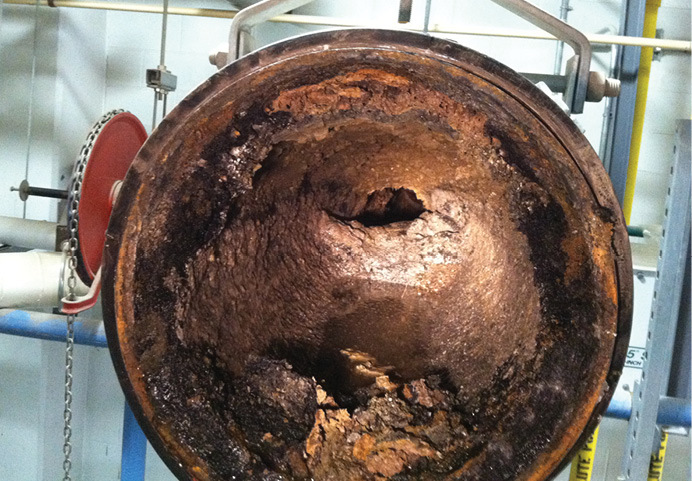 Another WWTP suffered from vivianite, a hydrated iron-phosphate scale. It is similar to struvite in that it is a crystal that impacts their sludge line and centrate/thickening lines. This crystal forms after waste activated sludge and primary sludge is blended and thickened. Iron is used in their activated sludge process to remove phosphorus from their liquid stream and results in vivianite in their sludge stream. A HydroFLOW trial in the fall of 2016 reduced vivianite scaling by about 50%. Based on the above positive results HydroFLOW Canada is currently working with a number of municipal wastewater treatment plants on struvite and polymer reduction applications and trials. Douglas L. Miller is a consultant for HydroFLOW. This article appears in ES&E Magazine’s October 2017 issue.